Whether your friends and family live across town or across the country, sending homemade baked goods for Christmas is a great way to share the holiday spirit. To make sure your treats will arrive just as fresh and as appetizing as when they were shipped, here are some tips for packaging and sending your holiday baked goods. First off, make sure your treats are sturdy and can stand up to the rigors of shipping. Avoid fragile desserts that will crumble easily. Drop cookies or bars hold up well in transit, as do brownies and fudge. Seasonal bread in flavors like pumpkin or cranberry orange travel nicely, too. Variety is great, but be sure not to mix and match a lot of different flavors in one bag or box. Baked goods packaged in cramped quarters tend to absorb each other’s flavors. Gift baskets are a fun and attractive way to send Christmas goodies. Just make sure each item is individually and securely wrapped. Add some fruit and nuts to balance out the sweets. 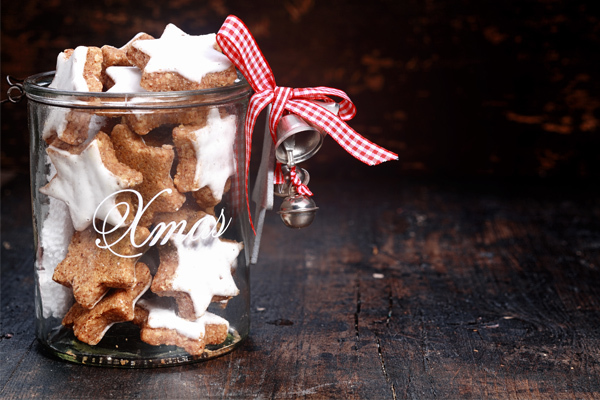 Fill a glass jar up with all the ingredients of your favorite cookie recipe, tie the recipe onto the lid, and wrap it all up with a Christmas ribbon! Small jars also work well for shipping single cupcakes. What Packaging Do I Use? The ideal time to pack up your baked goods is right after they have cooled completely, as this is when they will be their freshest. Then it’s just a matter of picking the packaging to send those treats off in! Gable boxes make an attractive and sturdy container for baked goods. With over 500 styles and sizes of gable boxes to choose from, you’ll be sure to find the perfect box for your Christmas desserts. 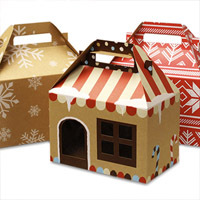 We even have specific holiday-themed Christmas pattern gable boxes! Perfect for small candies, jelly beans, fudge, or loose treats, our printed seasonal cello bags come in a wide variety of designs. From snowflakes and candy canes to snowmen and Christmas trees, your friends and family will be delighted when they receive your holiday baked goods. The presentation is key when displaying your holiday baked goods. Keep those sweets neat and tidy with our colorful liners and food wraps. From printed liners for gift baskets to waxed food tissue sheets, our food safe wrappings will add some colorful cheer to your holiday baked goods packaging. 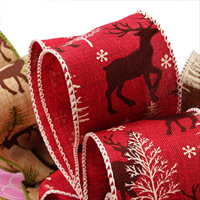 No holiday gift is complete without a Christmas ribbon! Polish off those delicious desserts with a festive ribbon embellishment. Crushed velvet, flocked, and printed satin ribbons can take your Christmas baked goods from ho, ho, hum to something extraordinary! Your friends and family will love your homemade baked goods. Include a recipe card for the goodies you send and a small kitchen accessory like a spatula or a set of holiday tea towels to finish off the package! If you’re looking to package and ship your holiday baked goods, check out our collection of popular Food Packaging! We offer food safe packaging for wine, bakery supplies, candy, and more. If you loved this how to, stay tuned. We’re looking forward to helping you upgrade your gift packaging with more DIY craft videos, product features, and tips for small businesses. Nice blog good work i like it thanks for sharing.